Even as a morning person, the last thing I want to spend ages on after rolling out of bed is my beauty routine. It’s so much easier on those mornings when you wake up and have effortlessly flawless skin, feel bright and fresh, and full of energy. Well, recently I think I’ve got myself into a pretty good routine which helps me wake up with glowing skin, feeling refreshed and ready to take on the day. The first step to a good night’s sleep, and therefore waking up refreshed, is to be calm and relaxed before hitting the pillow. 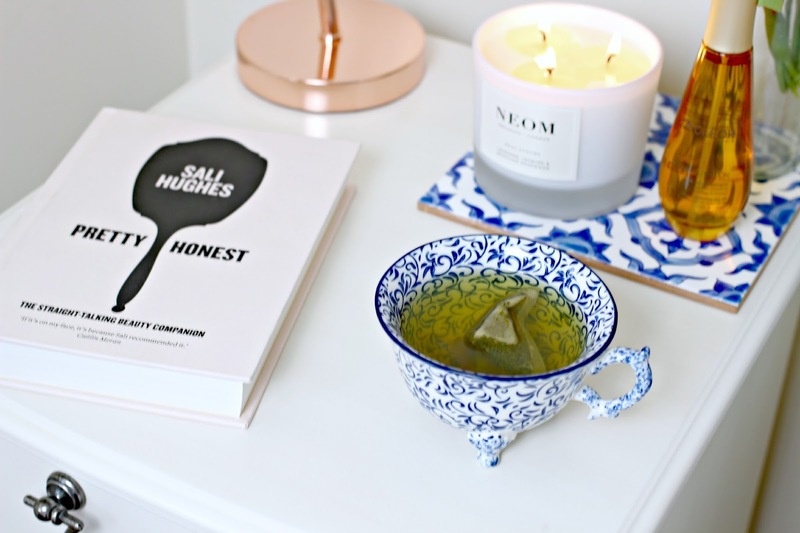 I love to spend 20 minutes or so with no technology, enjoying a cup of herbal tea to unwind before bed. If I have lots of time *aka, never* then I’ll have a lovely long bath, but recently I just havn’t had time to enjoy this luxury! 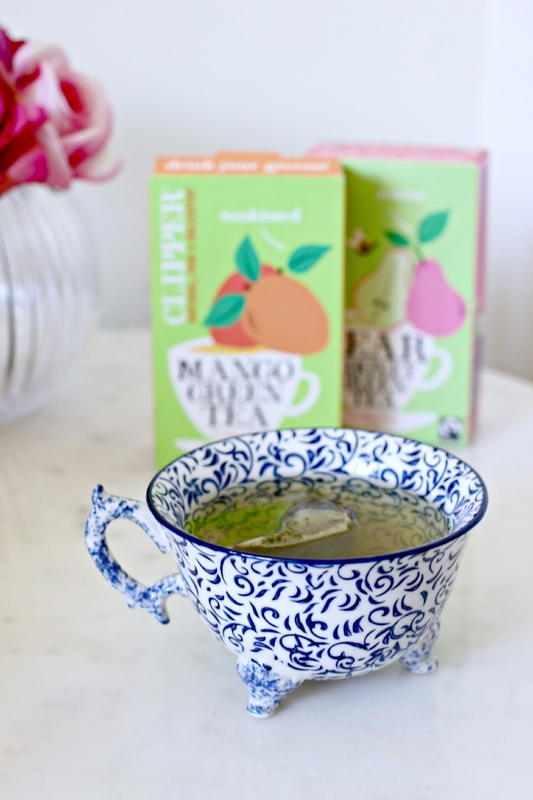 I’ve been enjoying a cup of Green Tea though, and especially some new flavours like Mango and Pear from Clipper. I’m not sure if there are any scientific facts that show tea actually acts as a sedative, but the whole ritual of drinking and unwinding sure does the trick for me. While there may not be caffeine in your tea, a good place for caffeine can be in your eye cream. Look out for caffeine as a key ingredient in your eye cream, as it keeps the fluids in the area moving while you sleep, so your eyes will be less puffy in the morning. Another trick to solving swollen eyes in the morning is to add an extra pillow and sleep on your back. This also aids the fluid movement around your eyes and can keep puffiness at bay. Sleeping on a cotton pillowcase can create creases in your skin while you sleep, so investing in a silk or satin one can be an easy way of preventing wrinkles, and also hair breakage too by lessening the pressure on skin and hair. 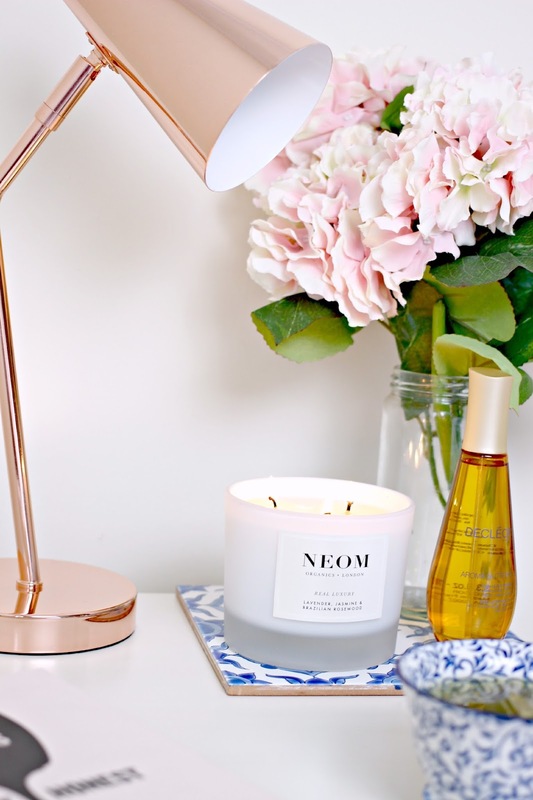 A few other things I like to do to chill out before dozing off is lighting a candle with a calming fragrance, my current favourite is the Real Luxury candle from NEOM. As far as candles go, this one is pretty spectacular. It’s huge with three wicks, and contains a therapeutic blend of 24 pure essential oils. 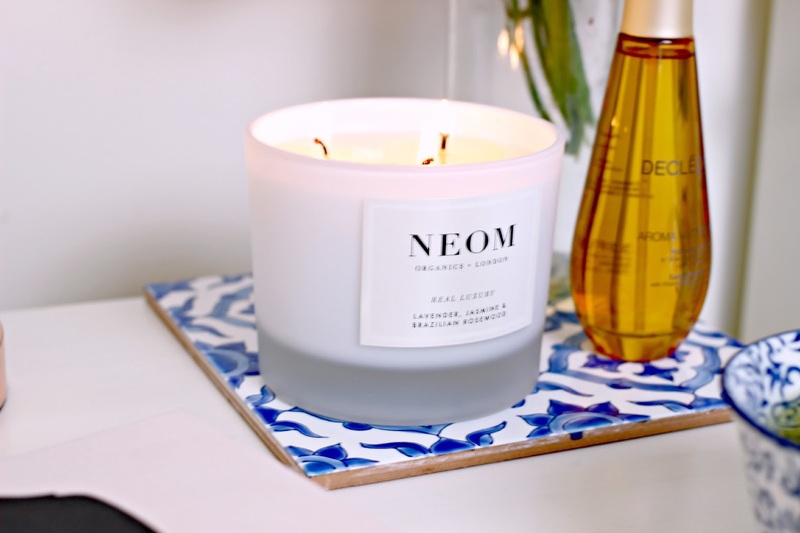 Designed to help you de-stress, the subtle scent includes Jasmine oil which lifts the spirits and inspires optimism, as well as the ultra-relaxing scent of lavender, and comforting rosewood. Of course reading a book is a perfect way to drop off to sleep, but I find the effects of reading almost too good, I drop off before I’ve even finished the page most of the time, so a book that you can pick up and put down without having to follow a story is ideal to keep by your bedside. 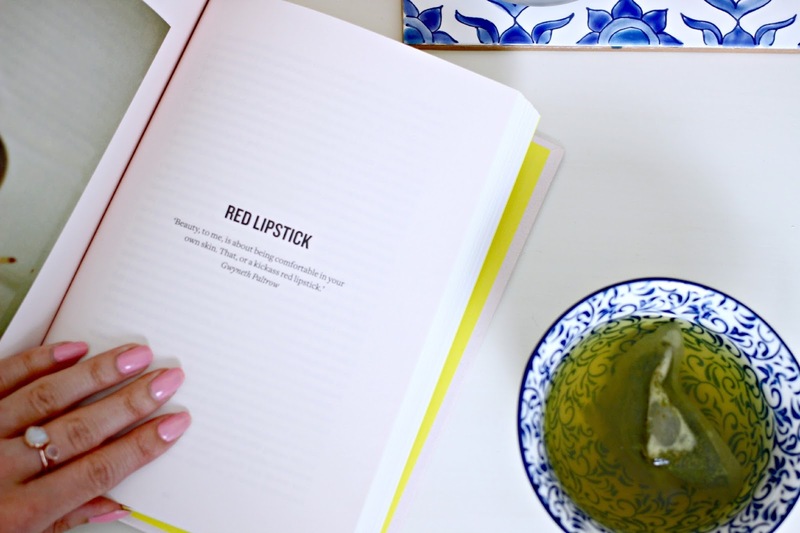 My favourite at the moment (along with every other beauty blogger in the entire world) is Pretty Honest. If your nails are in need of some attention, apply some cuticle cream or oil before you drop off to sleep, and you’ll wake up with healthy, hydrated nail beds, all ready for your manicure! Here are my manicure essentials. Oils have so many uses before bed. For inhaling the gentle calming aroma, to nourishing the face, hair and even nails, there isn’t a product more multi tasking than a lovely oil. I’ve been applying the Decleor Aroma Nutrition Satin Softening Dry oil to my body and also hair, which leaves my skin feeling silky soft and full of goodness, and with a lovely delicate scent thanks to the Frankincense essential oil, and Camellia and Rose. I saturate the ends of my hair with several pumps and then twist my hair into a bun at the nape of my neck, which means I wake up with glossy, natural waves. 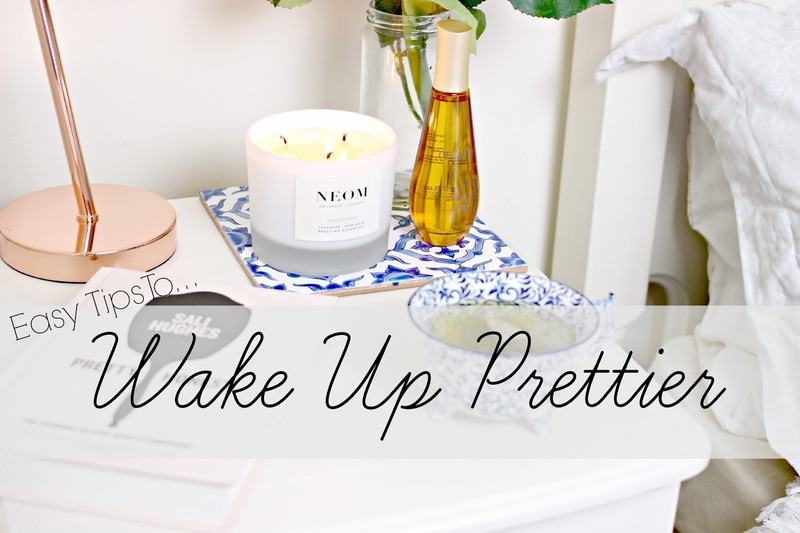 Do you have any tips for how to Wake Up Prettier? Previous Post Whats In My Beach Bag?